I'm very late getting to the blog tonight because I've been glued to PBS since 360 ended. They are showing a 2 part documentary in the Art Masters series on Andy Warhol. This documentary was produced by Anderson and Gloria's friend Diane Von Furstenberg. Warhol was the most important artist in the 2nd half of the 20th century and talented beyond belief. It just blows me away that, as a child, Anderson actually got to meet him. From Dispatches page 170; "The rooms were filled with actors and artists, boldface names in society columns and kitchen conversations. Truman Capote was a frequent guest; his pudgy lisp made me giggle. Andy Warhol was there as well; his white hair scared me." Do you think life has come full circle and Anderson's white hair scares small children? I can't image it. As I've said before I would love to have a conversation with Anderson's mother, Gloria. She has had the most fascinating life and knew the most interesting people. I can't imagine being able to call Andy Warhol a friend. 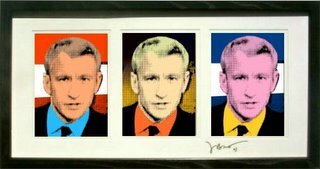 Here's a picture of Anderson that is done in Warhol's style. I couldn't find the picture Anderson talked about tonight of Hugo Chavez and Mahmoud Ahmadinejad greeting each other and holding hands. Did you hear snarky Anderson say "Wonder Twin Powers Activate"? Ahhh, more evidence of his misspent youth in front of the television. I've watched several interviews with Mahmoud Ahmadinejad so I had an idea how Anderson's interview would go. Ahmadinejad doesn't seem to understand the concept of the brief answer. He always seems to drone on and on without ever answering the question. IMO Anderson did better than Mike Wallace did with Ahmadinejad, on 60 Minutes, but I would image both were very frustrated by the experience. If you're interested in viewing the 60 Minute interview just follow the link. That's it for me tonight. My poor computer is on its last leg and I'm always afraid that it will crash before I finish blogging. I think DH and I have decided to buy a new one with all the bells and whistles. Soon I'll be able to screencap, well let me rephrase that. Soon my computer will have the ability to screencap, but whether I can learn the technology is another question. I'll leave you with a beautiful cap from someone who has mastered the technology. Thank you Liberation337. i'll have to check their listings and see when that special runs again. love warhol! i completely lost track of time and missed last night's show. i got sucked into "grey's anatomy" yet again. *sigh* i know, bad faerie, no biscuit! I love Warhol. I went to Halloween dressed like him a few years ago, it was a big hit. Also, in Berlin they had an amazing exhibit of some of his work and personal papers, etc. 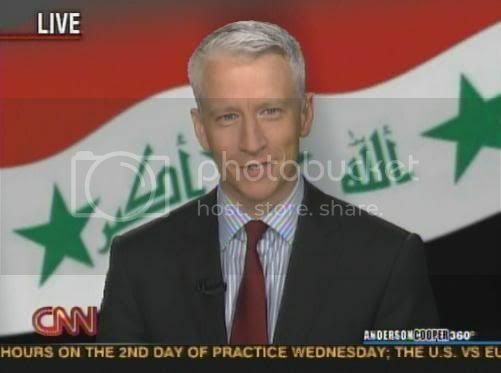 Yeah, I was pretty frustrated by Anderson's interview with the Iranian president. The man definitely sopke in circles and said absolutely nothing. I was however impressed with Andersons reply about there being a free press in America, unlike in Iran when he was accused of not asking the questions he really wanted to ask. In keeping with the presidential interview topic (but off the Anderson topic, sorry), the best interview on CNN last night was Larry King talking to Bill Clinton. I work nights, so I have to record 360. (Actually, I record all of CNN's live progamming in order to catch Mick's reporting. My poor TiVo works harder than I do!) I haven't yet watched all of last night's show, but Anderson did have a LOL moment at the beginning of Mick's report -- he tossed to one of those introductory video clips with Voice Of God audio (you know... "Terror In The Skies, Do You Know Where Your Children Are?") and the clip didn't start. Several seconds of silence, then they cut back to Anderson. "...And that's what they call a technical problem."